Thus, it is important to understand that he is “Formless”. Though all forms belong to him and he is happy in whatever way you look at him yet there is no single form in the world that describes him. Hence, you may see him in Durga as a mother, in Ganesha as a brother, in Vishnu as the preserver, in a dog, a cat, an insect, tree or anything…………he is “sarvavayaapi”, “sarveshwara”. I must mention here that the 3 forms in which the world appers ie: “HE-SHE-IT” arise out of him. We refer to Shiva as “HE” in order to keep up with the conventions. Hence, He himself is beyond sexes of he, she and it and remains the base from where he, she and it emerges, stays, transforms and desolve. The philosophy behind the image of Shiva- The image of Shiva that you see in posters, tv etc has a philosophy behind it. However, it must clearly be known that the picture doesn't describe Shiva completely. Hence, when we worship Shiva, we worship a philosophy and not an image. 1.BLUE BODY OF SHIVA- Whenever i ask someone as to why Shiva is painted blue? The answer that i get is that “he drank the poison/halahal of the ocean and so his body turned blue”. Well that is not true at all even from the mythological point of vie because the halahal stopped in the kantha and he thus was called “Neelkantha”. Then why is the body painted blue??? Well!!! the philosophical reason is that blue is the last colour that our eye can see. This is the only reason why the sky appears to us as blue when molecules in the air scatter blue light from the sun. Since the sky is nothing but space and space is limitless, birth-less, deathless, boundless, directionless. Hence, Shiva is depicted as blue as he is the last that our aatma knows. He is just like the Sky/space which is limitless, birth-less, deathless, boundless, directionless. these 3 gunas exist is nature, humans food etc. It is hence always advisable that people who wish to progress in spiritual sphere follow a SATTVIC life free from foods such as non-veg, onions, garlic and actions such as abusing, anger etc. Many yogis and saadhus wer rudraksh so as to balance their gunas and energies. Shiva’s Tripund is a symbol that he is the possessor of all the 3 gunas and yet he himself is “Nirguna” and unaffected by any of the gunas. Gunas form the base of our Karmas. 5.DAMRU- represent the cosmic sound. The sound OF Damaru is called Pranavamand represent the “Shabda Brahma” or OM. It is from which came out grammar and music. When a damaru is vibrated, it produces dissimilar sounds which are fused together by resonance to create one sound. The sound thus produced symbolizes Nada, the cosmic sound of AUM, which can be heard during deep meditation. In the scriptures, it is said that when Shiva mode of creation, his damru vibrates 14 times. These 14 basic formulae contain all the alphabets in sanskrit arranged in ways to facilitate various grammatical processes. Therefore, the Damaru represents the alphabets, grammar, and language itself. It represents all words, spoken or written; all arts and sciences, sacred and secular. It represents knowledge, both sacred and secular. When the Damaru is twisted in one revolution, it often makes the sounds of three successive tones. The sounds that Lord Shiva made with His Damaru were a-i-un, r-lR^i-k, etc. These sounds are know as the maaheshvarasuutras. The damaru is the sound of Sunyata or complete openness, a bridge that connects us to the essential source, the basis of being that is beyond name and form. It is also a unique channel for the profound blessings and power of the lineage and a portal for the mystical forces that protect the dharma. The damaru is thus the sound of the dharma itself and a proclamation of the fearlessness of the solitary yogin or yogini. Damaru is a balanced cosmic music. 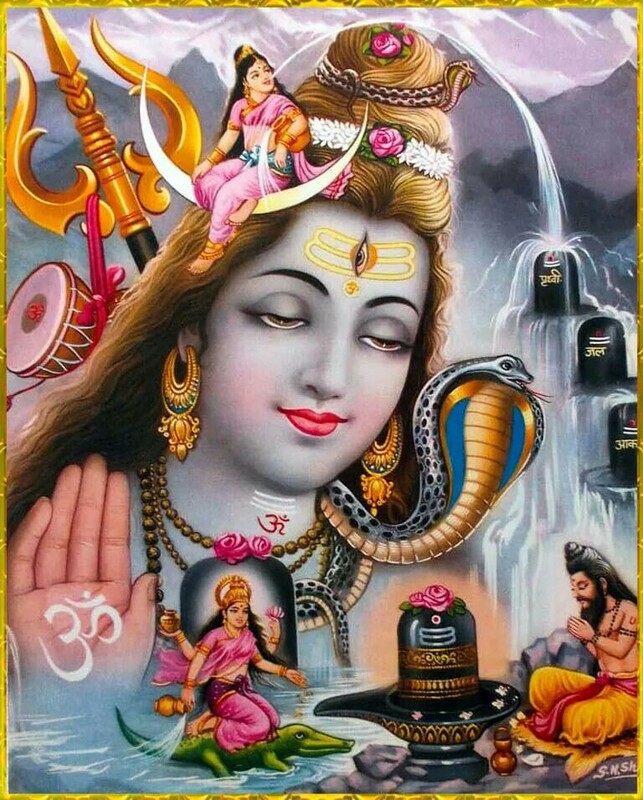 Siva is inseparable from His Shakti and therefore Mahadeva is genderless. 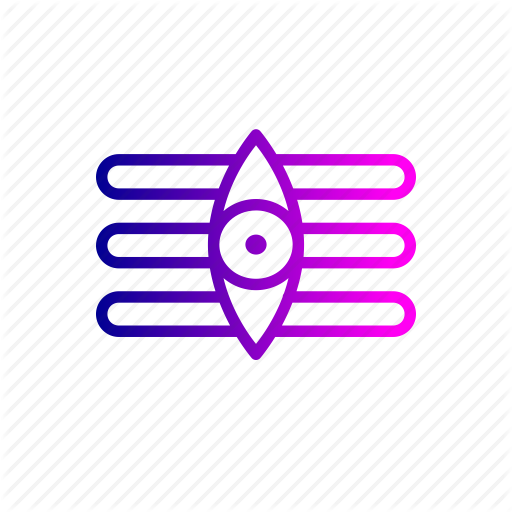 Siva the ida – feminine and the pingala- masculine nadis. Nadis are psychic nerve currents are balanced so that sushumna is ever active. The sadhak who balances these through sadhana and yoga becomes like Siva. In the unity of Ardhanarishvara all opposites are reconciled; duality vanishes back into the one source. 6.THE 3RD EYE- Siva is often depicted with a 3rd eye and called Triyambhkam, Trinetra etc. The thirs eye is a symbol for Shiva devotees to develop the sight of knowledge. Our 2 eyes are not always sufficient to judge things and know realities. Shiva’s third eye represents the rejection of desire. It is the eye that killed The Kama as per Maha Shivapurana. The killing of passions and desires is not only important for a sadhak, yogi and sanyaasi but is also important for a normal man stuck up in his day to day activities. Even a normal man must have Samta (balance), Sadhuta(purity of character) and doordarshita (broader vision). He must not fall pray to desires arising out of women(other than wife), money(other than that which is earned by sweat and purity), fame(other than that which arises out of sattvic actions. Hence, fame arising out of dropping clothes or becoming a don is falling pray to desires that will bring about negative fruits in future). From the Yogic point of view, it is said that when the pineal gland or ‘third eye’ is awakened, one is able to see beyond space-time into time-space. It raises the frequency on which one operates and moves one into a higher consciousness.. with more research it is being realized that it is essentially a spiritual antenna the mystical third eye of ‘lord Shiva’. For many eons, the third eye has been seen as a way to reach higher levels of consciousness while still being present in a physical body. This concept of the pineal gland being the “seat of the soul” or the “spiritual gateway to all realms and all dimensions” This notion of the third eye is scientific fact. The purpose of this third eye is the key here, which opens the door to the metaphysical interpretations that ancient wisdom talks about. The pineal gland is also responsible for secreting two extremely vital brain fluids related to our mental health. Those are melatonin, which is the hormone that induces sleep, and serotonin, which is the chemical that helps to maintain a happy, healthy balanced mental state of mind, among other functions. By activating the pineal gland one can have live body experience into the universe as explained by our sages. Rishi vishvamitra is one very significant example. Ved Vyas and rishi Valmiki are few others who could look into future and universe both. 7. RUDRAKSHA- Often people say that rudraksha is the teardrop of Shiva. This is a very narrow interpretation as God is beyond pain, suffering and all other human emotions. being humans we try to see our emotions in our God and identify with him. However, this is not a fine attitude. We must remember our moral responsibility of not interpreting things simply based upon emotions. Rudraksha has been derived from the Sanskrit roots Rudra(Shiva) Aksha(Eye). 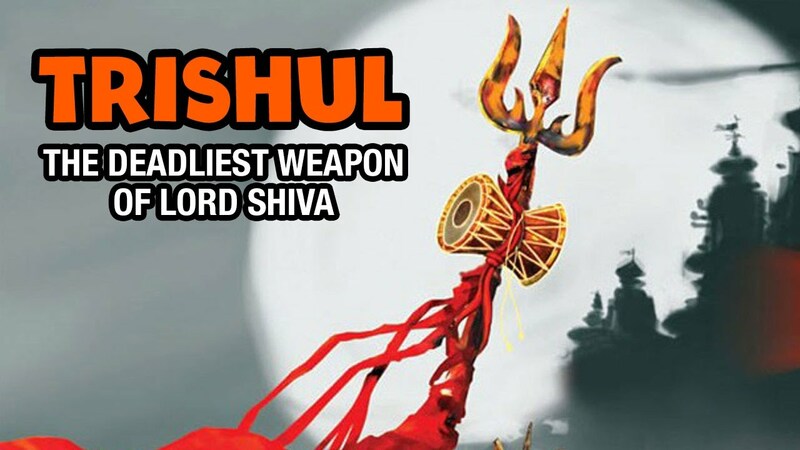 Hence, rudraksha means the eye of Shiva. 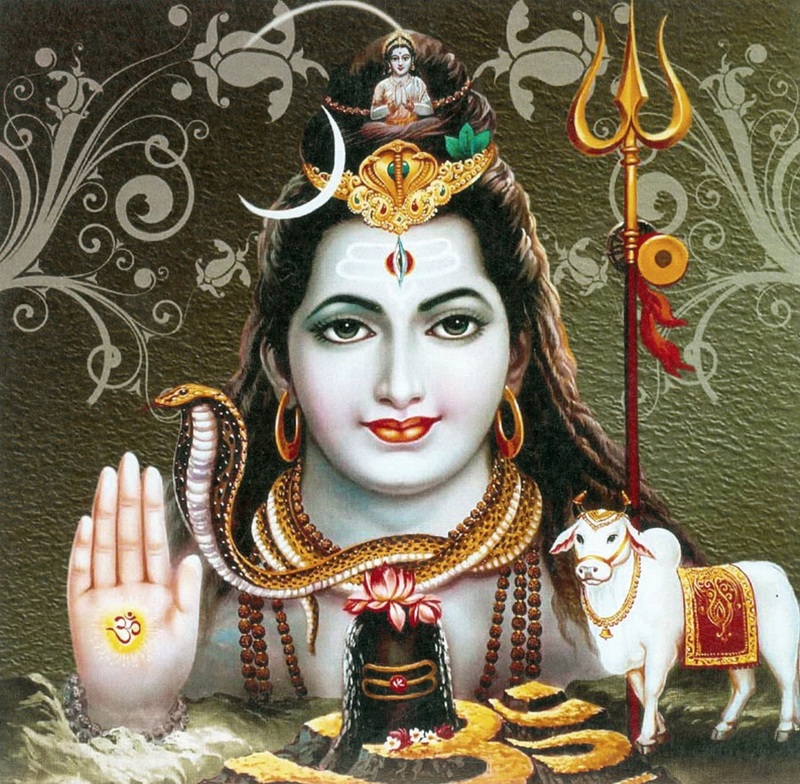 Since Shiva is TRINETRA…..rudraksh is referred to Shiva’s 3RD eye. The eye of knowledge. Rudraksha is a symbolism to the Shiva devotees, yogis and sadhaks to balance their chakras and energies by wearing it as rudraksha can lead a person to high spiritual know-how. 1. Wearing a Rudraksha is known to cure ailments like blood pressure, stress, anxiety, depression, palpitations, lack of concentration, etc. The bead enhances the powers of concentration, orients the mind towards attaining prosperity, boost confidence and energy levels, and is also known to increase the ability of speculative thinking. 2. There is scientific evidence to validate Rudraksha’s beneficial powers. The Rudraksha has strong electrical and magnetic properties. Besides storing electrical energy, a Rudraksha can send out subtle electrical impulses and induce vibrations. 3. 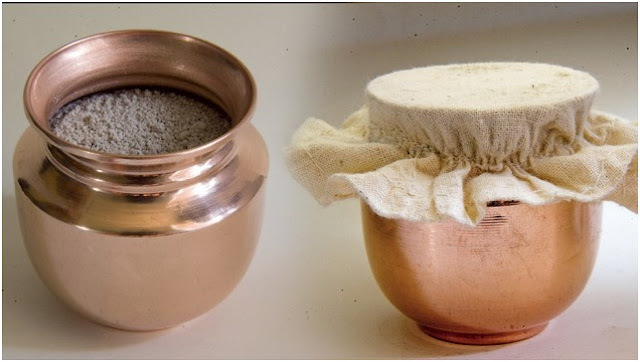 To understand the functioning of the Rudraksha, one must understand the workings of the human body the central nervous system, organ systems etc that form a part of the bioelectronic circuit. Sense organs respond to impulses like touch, smell, noise, sight, and taste as a result of bioelectricity. Bioelectricity transmits information from the brain to various parts of the body and vice versa. The bioelectric current is generated because of the different energy levels that exist at various levels in the body. So long as the bioelectricity flow between the body, mind, and brain is smooth, bodily functions are `normal’. The moment there is stress in this flow of energy the body starts malfunctioning. It is here that Rudraksha beads come to play a dominant role – that of a stabilizing anchor. Resistance: Specific Rudraksha beads resist the flow of bio-electrical impulses that cross the desired ampere requirement (leading to an imbalance in the brain-body-mind circuit). The beads act in tandem with the heart, streamlining it and sending out specific impulses to the brain. The impulses in return generate positive brain chemicals that induce us with a sense of confidence and energy. Capacitance: Electric energy can be stored in Rudraksha beads making them a safe stabilizing agent. This property of the Rudraksha makes it useful for controlling hyperactivity, palpitations, etc. The excess energy is stored in the bead thereby normalizing the bio-electric flow. Inductance: Rudraksha beads contain magnetic properties and hence send out inductive vibrations. This is the reason why people report of feeling better after wearing the bead (even if the bead does not touch them). Magnet: Rudraksha beads have dynamic polarity (i.e. the ability to change polarity). The flow of blood that is blocked or reduced results in various illnesses and ailments. The cells in the blood as also arteries and veins have positive and negative poles. When magnets are pressed into action to restore the imbalance the opposite poles of the magnet and that of the cells are attracted and open up contracted passages. Once blood flow is streamlined most illnesses are automatically cured. However magnets have a limited use, in the sense that they have fixed polarity, Rudraksha beads, on the other hand, have dynamic polarity and guarantee a total cure for a problem. Not only do Rudrakshas possess dynamic polarity they are also endowed with a quality called diamagnetism, ie. the ability to acquire temporary magnetic field in the presence of an external magnetic field. Depending on the polarity of the induced magnetic field, Rudraksha beads acquire a polarity opposite to the induced field. This results in the opening up of arteries and veins leading to a better health. 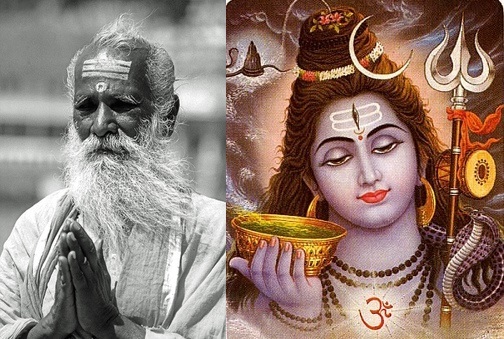 Mythologically, Daksha Prajapati cursed Soma/dev of moon and Shiva wore soma on his forehead and relieved him from the curse by saying that for every 15 days u will grow in size while in every 15 days ur size will reduce. I do not wish to talk much about mythology as mythology was created for those who had little access to education and did not understand science. However, from a scientific and philosophical point of view, the moon on Shiva’s forehead depicts control on time in terms of nature. The waxing and waning of the moon were used to calculate the days and months in earlier times. Thus, the moon symbolizes time and Lord Shiva wearing moon on his head denotes that Shiva has complete control over time and is beyond the measure of time and is eternal. Control on time and moon is important to control nature. An examples that i can quote here are the high tides and the low tides that arise due to the gravity of the moon. Hence, it is CHANDRASHEKHARA alone who can control time. Shiva’s snake is also a symbol of throwing away conservative thoughts about inequality. a true Shiva devotee will never disrespect or discriminate between a human, animal, tree, insect, and bird because he sees the SHIVAANSH in all. The snake also represents that any amount of criticism, venom, and insult given to you must be taken with the right view and be worn as an ornament. Do not be demotivated by criticisms instead use them as an ornament of strength to prove ur metal. On a Yogic level, the snake represents certain energies. Shiva has the snake around his throat. It is not just symbolic. There is a whole lot of science behind it. There are 114 chakras in the energy body. Out of these 114, people are usually talking about the seven fundamental chakras in the system. Among these seven fundamental ones, the vishuddhi chakra is located in the pit of your throat. This particular chakra is very strongly associated with the snake. The vishuddhi is about stopping poison, and a snake carries poison. All these things are connected. On the Scientific level, snake projects the DNA structure. Consider the points of similarity between D.N.A. and Shiva.It is well known that Shiva is Ugra and his name also is Ugra. Ugra means an acid. D.N.A. is also an acid. Vedanta calls that Hiranyagarbha as Sutratma.Sutratma means an Atma in the form of Sutra i.e. a thread or filament.The modern science admits that a DNA molecule is really like a thread or filament. “In a single human germ-cell this filament of DNA is about one meter in length”, says Watson in his book ‘The Double helix’. The Yoga-science calls it Mahan, the great. It is really great because it is present in all the living things.Its molecular weight is one million, so the scientists call it ‘great’. It has no birth. It develops from itself. DNA also duplicates, that means develops from itself. Mr. J. D. Watson describes this as ‘self-replication’.Sankhya calls it Vichitrarupa i.e. fantastically shaped. DNA also is fantastically shaped like a spiral staircase or Helix.Sankhya calls it Vishvatma meaning the Soul of the Universe.Modern science admits that DNA is the soul or the essential thing of the living world.It is named as Ekakshara, the immortal, the one who has no denudation, no loss, no end. DNA has no end, no loss – it duplicates or replicates itself, giving rise to itself. Thus all these seven points tally. It is said that Ahankar is developed form Hiranyagarbha.Ahankara literarily means a shape, which can call itself as ‘I’ (Aham). A Gene, Chromosome, and Nucleus are developed from DNA, all of which can call themselves as I or myself. From this Nucleus, a cell is formed, so the nuclear material is named as Prajabeeja.From this first cell many cells develop by multiplication. These millions of cells are Praja and the one from which all these originate is Prajapati. All these cells are microscopic, therefore they are named as Sukshma-Bhuta-Srushti, (the microscopic or unicellular living world). Here, we can include virus, bacteria and all single-celled organisms. A cell itself appears as a ‘Pindi’. The cell is Salunka, while its nucleus the Bana. It is said that after the microscopic world, the visible world (Sthula Srushti) came into being. This visible world contains 5 Sense organs and the mind. Details of Shivalingam.There is a central pillar, the Bana, surrounding which there is Salunka.Spiraling around the Bana there is a cobra or snake. There is Tripunda Gandha, a special mark on the forehead.This special mark is really special.It appears to be a picture of a snake spiraling around an axis.It looks like a spring. This shape resembling a spring is very important.We know that the DNA molecule is a Helix.The modern scientists compare it with a spiral staircase and call it a Double Helix, while the ancient sages have compared it with a spiral of a cobra.The Cobra takes the support of Bana. DNA takes the support of nucleus.The ancient comparison depends more on reduplication.The reduplication of DNA fiber mimics the population of the snakes.The snake is a living thing like DNA, but the staircase is not living. The modern scientists (Watson and Crick) have prepared a model in 1953 of a spiral staircase to depict DNA molecule; while the ancient sages have prepared a model to depict the same DNA and that model is the Shiva-Lingam.To have the sense of life in that model, they thought of the spirals of a cobra and to make it reach a common man, they put forth an idea of TripundaGandha, a sacred mark drawn on the forehead with our three Fingers dipped in the Sandal-wood-paste. 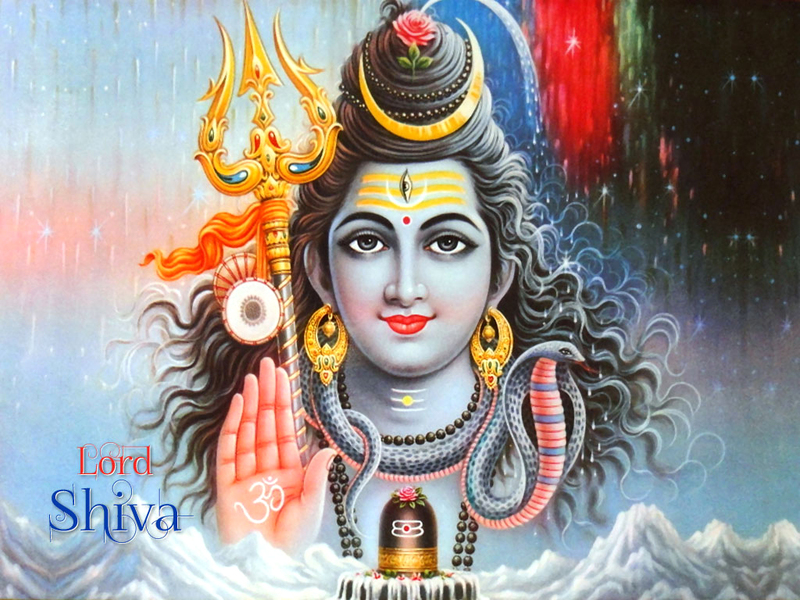 The Nucleic Acids are formed of four parts known as Mononucleotides.The four heads of Lord Shiva are the same four parts.Shiva is described to have three eyes. Thousands of heads. Now-a-days only four mononucleotides are supposed to be the bases of DNA.A single human germ cell DNA contains 10 raised to the power of 9 (ten raised to nine) base pairs.So the sages appear to be correct. We should not wonder about comparisons made with the human parts like head, eyes etc by the ancient sages;because Noble Laureate Watson also has compared the sugar-phosphate linkage with the back-bone, in his book.The Double Helix’. Such a comparison is not unscientific because it is essential for a common man to understand the subject. Demonstrating one of the decoded hymns of the Rig Veda Dr Trivedi explained, “The Tvasta (as the DNA is referred to in the Rig Veda) that gives shape to all creatures is termed as an omni form (visvarupa) and it proves that DNA is present in all living beings. The same hymn goes further and identifies the ‘Brhaspati’ which is the nucleus embedded in the DNA. Similarly, there are codes for photosynthesis, the development of eukaryotic cell, bio-geo chemical cycle, oxidation, and reduction, and even global warming, which is elucidated in Atharva Veda, which is what comes at the end of consumption of the world’s resources. 10.BAGHAMBAR CHAAL AND YOGIC POSTURE- Shiva is depicted sitting on a baghambar chaal in a yogic posture. This suggests to a devotee that with the practice of Yoga and meditation one caan know himself and he who understands his real roopa as “ahm brahmaasmi” or “Shivoham” sits victorious on all his fears. Tiger is an animal that produces fear. However, Yoga don't mean the yoga followed nowadays, which has been reduced to mere exercise. Yoga means “ASTANGA YOGA” and one has to follow the 8 limbs of yoga to be a Siddha. In Yoga Sutra, the eightfold path act as guidelines on how to live a meaningful and purposeful life. They serve as a prescription for moral and ethical conduct and self-discipline; they direct attention toward one’s health, and they help us to acknowledge the spiritual aspects of our nature. Ahimsa: nonviolence in thoughts, actions words, food, spirit, earning. Satya: truthfulness in thoughts, actions words, food, spirit, earnings. Asteya: nonstealing of thoughts, property, idea, money. Aparigraha: non-possessiveness. Being free from “MYness and Iness”. ie: My house, my money, me etc. Niyama, the second limb, has to do with self-discipline and spiritual observances. Regularly attending temple or church services, saying grace before meals, developing your own personal meditation practices, or making a habit of taking contemplative walks alone are all examples of niyamas in practice. Asana: the postures practiced in yoga, comprise the third limb. In the yogic view, the body is a temple of spirit, the care of which is an important stage of our spiritual growth. Through the practice of asanas, we develop the habit of discipline and the ability to concentrate, both of which are necessary for meditation. Generally translated as breath control, this fourth stage consists of techniques designed to gain mastery over the respiratory process while recognizing the connection between the breath, the mind, and the emotions. As implied by the literal translation of pranayama, “life force extension,” yogis believe that it not only rejuvenates the body but actually extends life itself. You can practice pranayama as an isolated technique (i.e., simply sitting and performing a number of breathing exercises), or integrate it into your daily hatha yoga routine. These first four stages of ashtanga yoga concentrate on refining our personalities, gaining mastery over the body, and developing an energetic awareness of ourselves, all of which prepares us for the second half of this journey, which deals with the senses, the mind, and attaining a higher state of consciousness. Pratyahara: the fifth limb, means withdrawal or sensory transcendence. It is during this stage that we make the conscious effort to draw our awareness away from the external world and outside stimuli. Keenly aware of, yet cultivating a detachment from, our senses, we direct our attention internally. The practice of pratyahara provides us with an opportunity to step back and take a look at ourselves. This withdrawal allows us to objectively observe our cravings: habits that are perhaps detrimental to our health and which likely interfere with our inner growth. Dharana: As each stage prepares us for the next, the practice of pratyahara creates the setting for dharana, or concentration. Having relieved ourselves of outside distractions, we can now deal with the distractions of the mind itself. No easy task! In the practice of concentration, which precedes meditation, we learn how to slow down the thinking process by concentrating on a single mental object: a specific energetic center in the body, an image of a deity, or the silent repetition of a sound. We, of course, have already begun to develop our powers of concentration in the previous three stages of posture, breath control, and withdrawal of the senses. In asana and pranayama, although we pay attention to our actions, our attention travels. Our focus constantly shifts as we fine-tune the many nuances of any particular posture or breathing technique. In pratyahara we become self-observant; now, in dharana, we focus our attention on a single point. Extended periods of concentration naturally lead to meditation. Dhyana: Meditation or contemplation, the seventh stage of ashtanga, is the uninterrupted flow of concentration. Although concentration (dharana) and meditation (dhyana) may appear to be one and the same, a fine line of distinction exists between these two stages. Where dharana practices one-pointed attention, dhyana is ultimately a state of being keenly aware without focus. At this stage, the mind has been quieted, and in the stillness it produces few or no thoughts at all. The strength and stamina it takes to reach this state of stillness is quite impressive. But don’t give up. While this may seem a difficult if not impossible task, remember that yoga is a process. Even though we may not attain the “picture perfect” pose, or the ideal state of consciousness, we benefit at every stage of our progress. Samadhi: Patanjali describes this eighth and final stage of ashtanga, Samadi, as a state of ecstasy. At this stage, the meditator merges with his or her point of focus and transcends the Self altogether. The meditator comes to realize a profound connection to the Divine, an interconnectedness with all living things. With this realization comes the “peace that passeth all understanding”; the experience of bliss and being at one with the Universe. On the surface, this may seem to be a rather lofty, “holier than thou” kind of goal. However, if we pause to examine what we really want to get out of life, would not joy, fulfillment, and freedom somehow find their way onto our list of hopes, wishes, and desires? What Patanjali has described as the completion of the yogic path is what, deep down, all human beings aspire to: peace. We also might give some thought to the fact that this ultimate stage of yoga—enlightenment—can neither be bought nor possessed. It can only be experienced, the price of which is the continual devotion of the aspirant. 11.GANGA-The Ganga is considered the life source or all apart from the fact that it has high science proved and mythological significance. its descend from the mated locks of Shiva is a symbol of continues flow of mental energies and knowledge which is the source of parmananda. On a mythological level, it is believed that King Bhageeratha performed Tapasya to MAHADEV in ordered to bring Ganga onto the earth so that he could help his 60,000 ancestors in order to liberate. These ancestors were reduced to ashes by an angry saint (Kapil). Shiva granted him the boon and in order to break the flow of the Ganga (so that the powerful flow dznt lead to destruction on earth), Shiva consumed it in his matted locks.